Lyme disease is very dangerous, but many people don’t know as much about it as they should. Knowing these 6 important Lyme disease facts can help keep you safe. After frolicking around the woods, you notice something out of the ordinary. There’s something pierced in your skin and it won’t flick away. You come to the alarming realization that it’s a tick. You need to remove it ASAP. Otherwise, you could be at risk of developing Lyme disease. This is a scenario that thousands of people find themselves in every year. Despite it being so common, few people truly understand Lyme disease facts. What is this disease and how infectious is it? Where is it most prevalent? How do you treat it and will it ever go away if you do develop it? If you’re ready to learn all about Lyme disease, here are 6 facts you need to know. Lyme disease is a bacterial disease that spreads from the bites of infected deer ticks. These are also known as black-legged ticks. You don’t need to come into direct contact with deer to catch Lyme. But if you live in areas inhabited by deer, are you likely to still come into contact with ticks? Anywhere there’s deer, there are ticks. So, if you spend a lot of time in grassy, wooded areas, you’re more likely to encounter them. But that doesn’t mean you’re completely safe anywhere else. There are no known causes of humans transmitting Lyme disease to other humans. Lyme disease caused by Borrelia bacteria is most common in the Northern Hemisphere. But each year, there are cases reported on every continent — except for Antarctica. If ticks are most commonly found in the Northern Hemisphere, does that mean they prefer the cold? Not exactly. Cold temperatures below 44 degrees Fahrenheit make it difficult for ticks to find a host. If that’s the case, does this mean that ticks thrive in hot climates? Not exactly, either. Ticks rely on moisture to survive. If the humidity is less than 80%, ticks will die from dehydration. Summertime is commonly known as tick season. But you can still encounter ticks as early as April — no matter where you are. It’s important to familiarize yourself with the type of environment ticks thrive in. If you live in the south, for example, you’re more likely to encounter ticks in the early spring. That’s because the south has shorter winters and wetter springs. Swamps. Marshes. Anywhere that’s warm and covered from the sun, you’ll find ticks burrowed in the mud and grass. Even on tree branches and in bushes. Now that you understand a few interesting facts about Lyme disease, what are its symptoms? 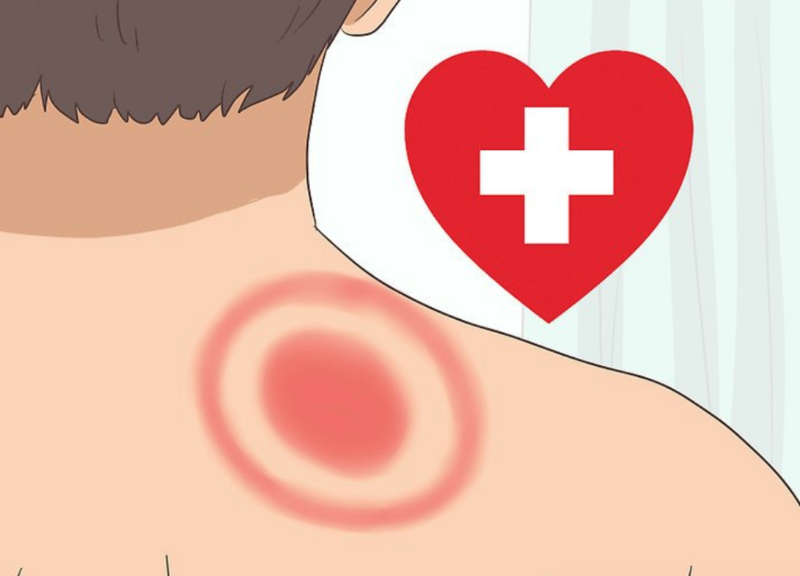 The tell-tale sign of untreated Lyme disease is a red rash that resembles a bull’s eye. This type of rash occurs in 70-80% of those infected. The rash begins with swelling and redness at the site of a bite. Then, a red ring will develop around the area and can expand as large as 12 inches in diameter. Rarely does a bull’s eye rash itch or feel painful. It can, however, feel warm to the touch. While it normally develops at the site of a bite, it can develop anywhere on the body. Lyme disease doesn’t always lead to a bull’s eye rash. Nor does any type of rash need to develop. Other physical symptoms of Lyme disease include swollen joints, body aches, chills, fatigue, and fever. Because these symptoms mimic the flu, Lyme disease often isn’t considered right away. The symptoms aren’t only physical, either. Lyme disease can cause memory problems, restlessness, and even sensitivity to light. Lyme disease can eventually cause heart problems and severe skin outbreaks. In children, Lyme disease can even impair their development. Untreated Lyme disease can eventually cause severe neurological problems. You can read more here about the symptoms of both early and later stage Lyme disease. If you or a family member have any of these symptoms, mention Lyme disease to your doctor. Only they’ll be able to diagnose or rule out Lyme disease by running blood tests. A strong course of antibiotics can cure Lyme disease. But patients can be sick — even hospitalized — for a long period of time. The sooner you see your doctor and get on antibiotics, the better. Looking for more Lyme disease facts? It may come as a surprise to learn that ticks are not insects. In fact, ticks are arachnids, making them part of the same family as spiders, mites, and scorpions. Because they feed on the blood of live animals, ticks are also considered parasites. There are all types of ticks and not all carry Lyme disease. Again, black-legged ticks (or deer ticks) are the ones you need to worry about. But even if you do get bit by one, that doesn’t mean it carries Lyme disease. Regardless, it’s important to take Lyme disease precautions — no matter what type of tick bites you! There are other tick-borne diseases besides Lyme. While in the woods, you should cover up all areas of your body, especially your ankles. They’re known to attach to areas like the groin, armpits, and scalp, as well. After spending time outdoors, be sure to give yourself a full-body examination. Ticks can be as small as a pinhead when they’re nymphs. The longer they infect and feed on blood, the larger they’ll get. It’s not uncommon for ticks to grow as large as a fingernail or penny. It takes an average of 36-48 hours for a tick to transmit Lyme disease. There are tick removal devices, which make for a wise investment especially if you have a dog or an outdoor cat. Of course, if you come across a tick that’s attached itself to the skin, you’ll want to remove it as soon as possible. A normal set of fine-tipped tweezers will suffice. The key to removing a tick is to grab it as close to its head as possible. But first, you’ll want to disinfect the area with rubbing alcohol. Once you grasp it close to its head, pull up and slowly. Keep a firm pressure on it and avoid twisting it or pulling it too fast. Lyme disease is a real risk that people face all over the world. But it shouldn’t keep anyone from enjoying the great outdoors. By understanding these 6 Lyme disease facts, you’ll not only know when you’ve come into contact with a tick. You’ll understand what you need to do to prevent Lyme disease from wreaking havoc on your health. It’s always better to be safe than sorry. The more you know about how to protect yourself, the more you can enjoy the things you love doing. Let us help you stay informed about your health so you can live your best life.